Built to last, the USA GEAR S13 Bag was designed to protect your console while withstanding the abuse of daily wear and tear. Complete with heavy-duty metal hardware, a reinforced weather-proof base, padded scratch-resistant interior and durable nylon material, this carrying case is perfect for travel or on-the-go use! The S13 provides two individual storage compartments that are separated by a secure compartment wall. On one side, there is a large space that comes with an adjustable divider and a security strap to ensure that your PlayStation 4 Pro is safety stored. The other section of the case includes several compartment dividers that allow for customizable storage for your controllers, cables, headset, games and other accessories. With plenty of internal space and 2 exterior pockets, this bag helps to keep you organized while fitting everything you need! This highly portable bag makes carrying your console easy. Throw the case over your shoulder with the adjustable padded shoulder strap. If you'd rather carry the bag by hand, simply lift it with soft-grip carrying handle. Have confidence in your purchase knowing that it is backed by the USA GEAR 3 Year Manufacturer's Warranty! Device Compartment: 15" x 12" x 3"
Accessory Compartment: 15" x 12" x 3"
New Travel Storage PlayStation Carrying Case Protective Shoulder Bag Handbag for PS4. High quality lining - Anti-tear, feel good, durable. Waterproof fabric - Waterproof, dust-proof, no smell. Exquisite zipper- Wonderful workmanship, soft enough and do not hurt the hand. Portable and shoulder design - Soft fabric feel comfortable, according to different needs of design. Double layer design - Using double-layer design, machine and accessories are separately installed to avoid scratch the machine. Easy to Carry With adjustable shoulder strap and convenient carrying handle,and the handle is wrapped in leather and feels more comfortable. Perfect Design PS4 travel bag is made from durable and high quality waterproof environmental nylon fabricand. And besides, No PS4 logo, more personalized. Front pocket holds 2 DUALSHOCK 4 wireless controllers, the PlayStation Camera, AC power cord, HDMI and USB cables and main pocket holds and protects PS4 Systems, Compatible Devices-Video Game Consoles. Full Protection: The travel bags are surrounded by anti-shock cotton inside for extra care on your loved PS game console system, It is the perfect gift to your kids & friends. After-sales service - If you are not satisfied with these PS4 travel carry bag for any reason, please contact us directly, we will provide quality customer service. 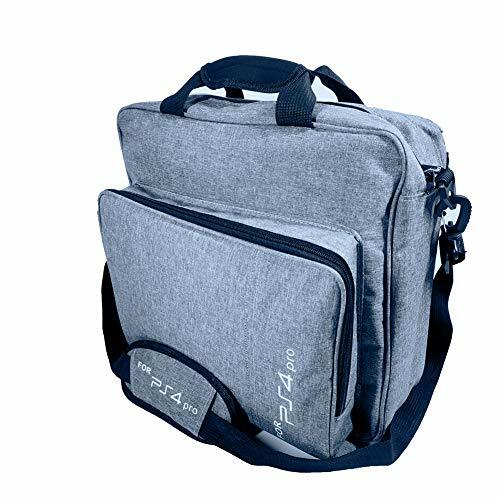 New Improved protective Carry shoulder handbags for PS4: This latest version of PS4 protective bag is made of sturdy premium nylon material and specially designed for PS4 and PS4 Slim. 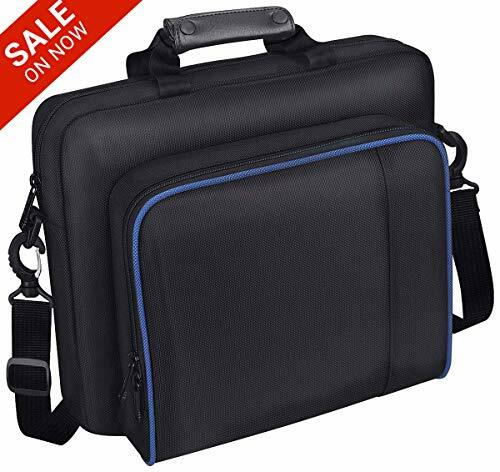 It is dustproof and anti-fall, it is 100 percent handmade and with excellent workmanship.It is not only a Game travel bag for your PS4 gaming consoles ,but also a storage case for your PS4 slim,laptop , working papers,Office Supplies,cellphone and other gadgets. We have improved our designed by removed:FOR PS4 logo so it is more personalized and applicable to many situations. It comes with adjustable shoulder strap and soft leather handle,you can carry your console and enjoy the joy it bring everywhere! 1: Unique design no logo. More personalized. 2:Soft leather handle: this PS4 case is equipped with classic leather handle, comfortable to hold and release fatigue. 3:100 percent handmade with excellent workmanship. 4: High quality materials:waterproof. Anti-fall ,dust and shock resistant. 5: Adjustable shoulder strap with widen pad : it is easy to carry over your shoulder, not only a handbag, but also a shoulder bag. 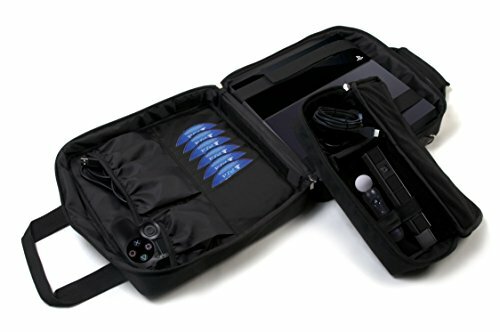 6: Double layer:Using double-layer design, this shockproof protective travel case store your game consoles and accessories separately. Scratch resistant. 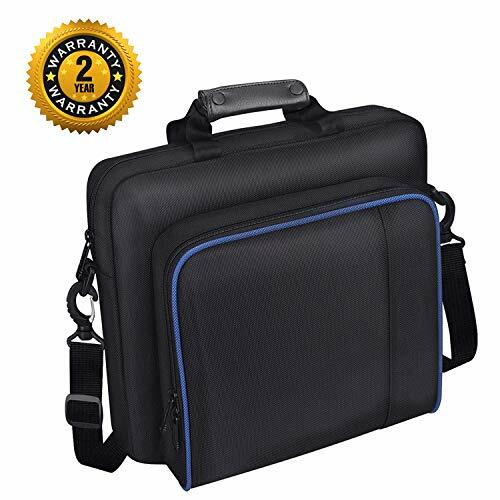 7:Multifunctional:this hard case carry bag is also suit for your laptop, documents, Office Supplies, gadgets etc. Full Protection This storage bag is surrounded by anti-shock cotton with soft two pocket compartments inside for extra care on your loved PS game console system, gadgets, controllers, cables and accessories. Durable and waterproof exterior This Playstation backpack is made from waterproof and shock resistant nylon fabric which is environmental friendly and durable. Besides, it is immune from abrasive damage and extreme weather like pouring rain and blizzard. The PS4 Dual shock 4 Deluxe Travel Case has a soft contoured Dual shock 4 controller compartment for easy, safe transport. The inside mesh pockets holds USB cable, ear buds and game disc. It has a convenient carrying handle and hard shell for maximum protection. This product is officially licensed by Sony. Take your PS4 System, games and accessories with you. Keep them organized and protected with for PlayStation4 System case. It holds your PS4 system, games, controllers and accessories. Main pocket holds and protects for PS4, PS4 Slim Systems. Convenient mesh inside pockets for games. Fully padded case for maximum protection,when you put your game console and accessory in the bag, pls dont Forced to dump the bag. Adjustable shoulder strap and convenient carrying handle. Outer size: 32 x 13 x 31 cm. CONVENIENT, ALL-IN- ONE CONSOLE WITH A VERTICAL STAND, DUAL COOLING FANS, CONTROLLER CHARING DOCKS, AND 3 USB HUB PORTS - are you looking for an original, reliable cooler stand to keep your PlayStation 4 from overheating? The Ortz PS4 Vertical Stand sports a dual USB charging station so you can simultaneously charge both your controllers, double cooling fans to keep your console operating optimally, and additional HUB ports so you can connect any other peripherals! WHISTER QUIET FANS SO YOU CAN FOCUS ALL YOUR ATTENTION ON WHAT REALLY MATTERS - THE GAMEPLAY - are you looking for a PS4 cooling stand that doesn't sound like a noise factory? You can now keep your PS4 console from overheating (and your table from burning) after long hours of gaming. The Ortz cooling fan works silently so you can focus your undivided attention on the gameplay during those intense sessions. MULTIFUNCTIONAL COOLING FAN FOR THE PS4 WITH SPACE SAVING DESIGN - are you tired of cheap-imitation PS4 cooling fans that hardly even work to dissipate the excess heat from your PlayStation 4 console? Take advantage of a tried and tested PS4 vertical cooling stand that's designed to maximize working hours and result in increased efficiency of your console. What's more? The Ortz PS4 Stand sports a vertical space- saving design so you can keep your gaming area neat and compact. THE #1 MOST ELEGANT, USABLE AND RELIABLE ON-THE- GO PS4 STAND - do you want to rid your gaming table of cables and other clumsy accessories. You can now leverage an all-in- one supportive accessory that'll make your gaming sessions longer and uninterrupted by a console that needs charging. 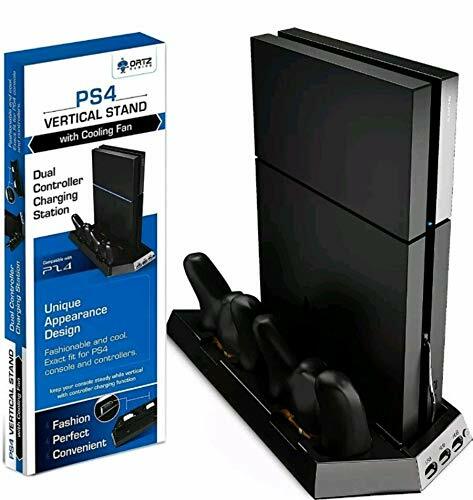 Cool your console and simultaneously charge your consoles with the #1 most elegant PS4 vertical stand in the market right now. YOU GET A POWERFUL-COOLER, NEAT, VERTICAL AND HIGH EFFICIENCY PS4 STAND, OR YOUR MONEY BACK - guarantee the longevity of your PS4 console with an accessory that delivers every time. The Ortz PS4 vertical stand is designed to provide maximum value for your money, and save you from a lot of hassle related to an overheated console, or controllers that are low on charge. Even better, you can now order this product risk free with our lifetime guarantee! 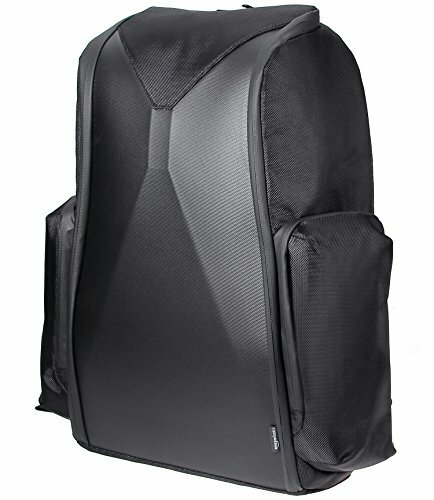 Our game bag is made of high-quality, environmentally friendly nylon fabric, waterproof, durable, large capacity, independent partition design to accommodate more accessories, full filling to maximize the protection of your game from damage or scratches, two kinds of carrying options can bring you convenience in any travel. This carrying case is the perfect choice for any player. Waterproof and Durable: The carrying case is made of strong, high-quality, environmentally friendly nylon fabric, which is waterproof and not easy to wear and tear. Large Capacity Space: Two separated compartments design, front bag design with elastic belt, can accommodate controller, power cord, HDMI and USB cable and other accessories. Main bag can accommodate PS4 system, video game console, etc. It's the perfect gift for any player. Easy to Carry: Two options for carrying, shoulder straps and handheld. Adjustable shoulder strap middle widening pad, reduce shoulder discomfort. Hands are wrapped in leather and feel more comfortable. Full Protection: Shock-proof cotton is used around the game console bag to protect the game system and accessories from impact and extrusion. At the same time, it avoids the interference of water and dust. Provide comprehensive protection for your PS game console. To maximize the protection of the game, when you put it and accessories in your bag, do not squeeze or dump it. After-sales Service: We value credibility and service. Our PlayStation 4 case are guaranteed for life. If you have any questions about carrying luggage, please feel free to contact us. We will try our best to solve this problem for you. Main pocket holds and protects for PS4, PS4 Slim and PS4 Pro Systems. Adjustable shoulder strap and convenient carrying handle. Outer size: 37 x 17 x 33.5 cm. ENHANCE Gaming's gaming backpack offers a portable gaming arsenal with a sleek modern style that is both practical and eye-catching. Compatible with all major gaming consoles and laptops, our gaming backpack offers incredible storage for all your gaming gear from laptops and keyboards, to consoles and controllers. It makes for an excellent xbox one carrying case or ps4 carrying case. Designed with an arsenal front storage cache that locks in place with a rugged 3-Point lock to easily store and access your accessories. A thick padded liner protects and organizes your accessories away from your console or laptop. Organize your gear how you like with a variety of pockets and straps all designed to hold gaming gear such as controllers, cables & adapters, games, wired & wireless mice, stylus, microphones, and much more. The entire bag is lined with a padded liner that protects against bumps, minor drops, and scratches. The exterior is made from a tightly woven RipStop nylon that offers weather and humidity resistance, while the bottom of the backpack features a waterproof base to help against accidental spills and wet ground. The bag features a side opening pocket the length of the bag with a padded divider to store larger objects such as gaming laptops, keyboards, consoles, and other longer accessories (Kinect, Playstation Move, etc.). The top loading section of the bag features a spacious and protected compartment to store almost any size gaming headset and some cables. Alternatively, this section can be used to store VR goggles and other devices. ENHANCE Gaming. Rise Above the Rest. 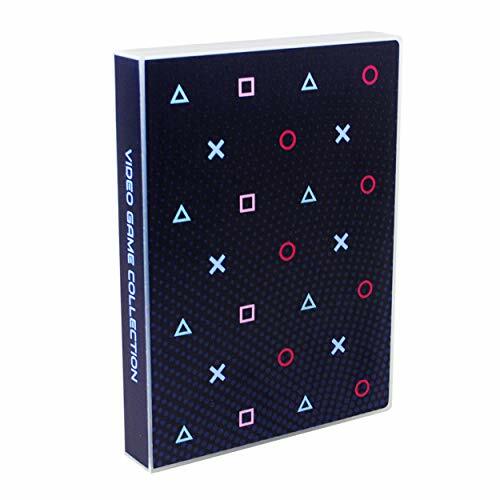 Store and protect your Sony PlayStation VR in this 100% licensed Sony PlayStation case, manufactured to Sony's stringent standards by RDS Industries. The PlayStation VR case has a durable hard-shell exterior that protects against accidental drops or knocks. A vacuum foamed felt lined interior holds the VR, cables and accessories securely in place. By far the best quality PlayStation VR case on the market. 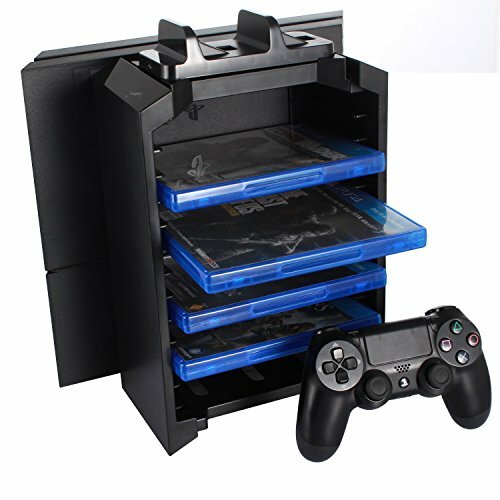 PS4 multifunctional storage stand is designed for gaming fans. This storage device is composed of five large pieces of plastic parts with different shapes, which is easy to assemble and dismantle. PS4 console on the right side. Besides two controllers can be charged simultaneously. With this stand, PS4 gaming controller, gaming discs and PS4 console can be put together, which can help to make gaming more comfortable. 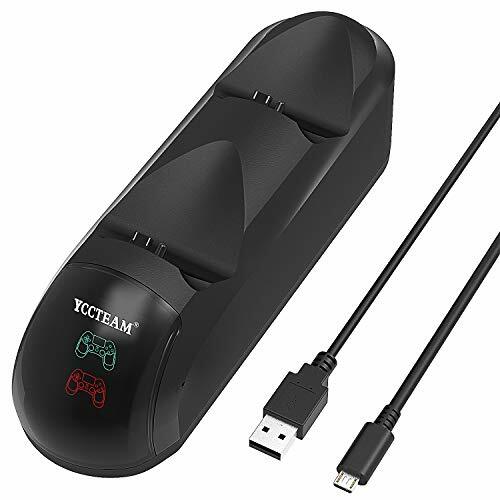 CLICK the ADD TO CART button above PS4 Game Storage Tower Controller Charger now ! All-in-One Design PS4 Console Vertical Stand + DVD Games Tower + Dual Controller Charger. Charge 2 controllers at the same time Charging station with 2 chargers to charge both PS4 controllers faster and at the same time.Charging Dock can be removed for portable use . Put your game CDs in place A game holder to store your 12 collection PS4 games, keep them in order and within your reach. Space-saving design Enables the whole PS4 with dual controllers and DVD games in a vertical position, space-saving choice. Also for better heat dissipation. Easy to use Easy to install and remove, make your playground more organized. A necessary for a player. Keep controllers fully charged and ready for action with twin docking station. The rapid recharge cradle enables you to power up two Dualshock4 wireless controllers. Red charging LED indicators turn blue once fully charged. No more cables! Simply attach the Micro USB dongles provided for simple drop and charge. Brand New Improved storage carrying shoulder handbags for PS4 pro PS4 and PS4 Slim: This latest version of PS4 protective bag is made of sturdy premium nylon material and specially designed for PS4 Pro, PS4 and PS4 Slim can also fit in. 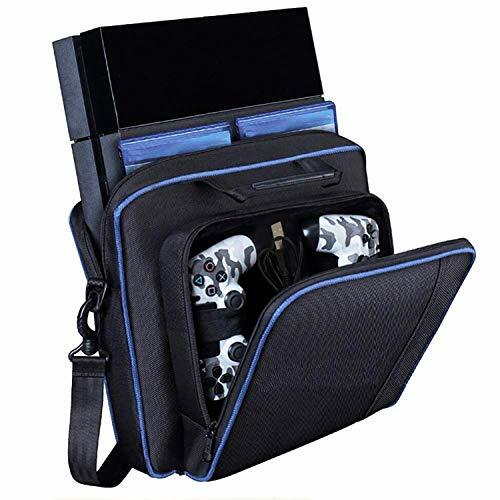 Dustproof and anti-fall, it is 100 percent handmade and with excellent workmanship.It is not only a hard storage bag for your PS4 gaming consoles ,but also a travel case for your laptop , working papers,Office Supplies,cellphone and other gadgets. We have improved our designed by removed:FOR PS4 PRO logo so it is more personalized and applicable to many situations. It comes with adjustable shoulder strap and soft leather handle, you can carry your Console accessories and enjoy the joy it bring anywahere! 2:Soft leather handle: the PS4 hard travel case is equipped with classic leather handle, comfortable to hold and release fatigue. 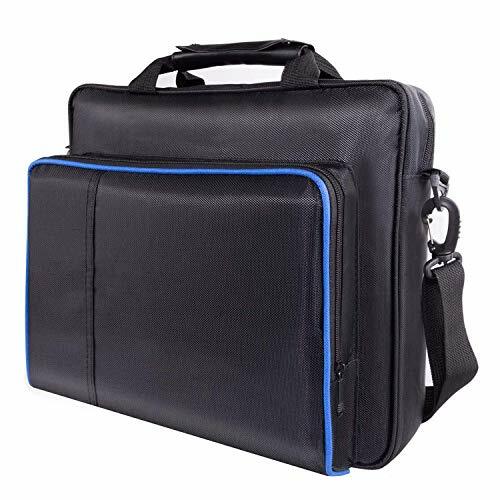 7:Multifunctional:this hard case carry bag is also suit for your PS4 ,PS4 Slim,laptop, documents, Office Supplies, gadgets etc. Full Protection The travel bags are surrounded by anti-shock cotton with soft two pocket compartments inside for extra care on your loved PS game console system, gadgets, controllers, cables and accessories. Welcome to Guila PS4 accessory store! 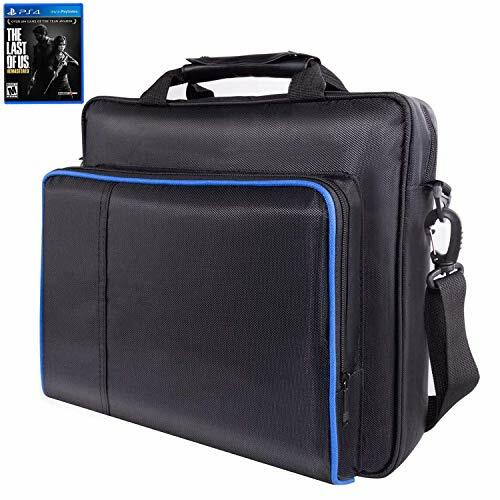 This PS4 carrying case may be your best choice! Why is the bag that I just received flat? This is normal, the package is passed through QC quality inspection clearance, then by the professional packaging unified box. At the same time, in order to protect the environment, the bag does not have any filling items, so the bag received will appear to flat. Will it be difficult to take care of if the bag is dirty? NO, Guila ps4 Bag are usually made of high-density polyester and nylon. It is both scratch-resistant and wear-resistant, if stain here, it is recommended to wipe the stain with clean water and detergent. There is no need to wash in water totally. Why is this bag so beautiful? We always aim to provide the best PS4 for players. As one of the same ps4 players, we are tired of the stereotyped ps4 accessories. We decided to do our own design to give players more choices. We will continue to design more new and interesting products for you before we become bald. Unique color In the realization of the ordinary ps4 package features at the same time the use of a more colorful color scheme, makes you look better when you're carrying it! Elaborate production Environmentally-friendly nylon provides better breathability and a more comfortable feel, and the design of a double ply fabric provides waterproof and cushioning, providing comprehensive security for your ps4. Customization Front pocket holds 2 DualShock 4 wireless controllers, for PlayStation Camera, AC Power cord, HDMI and USB cables. Completely customized for video game equipment. Comfortable carrying Whether carrying it or carrying it on your shoulder, its soft handgrip and adjustable cushioned shoulder straps offer a more comfortable experience. Larger Capacity Its larger size(14.5 x 13.1 x 6.7 inch) compatible for all PS4 or ps3 series consoles. This padded case is not only for comfy carrying but also for safety on the move. Larger capacity, very easy to storage your PS4 game equipment securely. You can take them anywhere with this portable bag. * Made of high quality environmental nylon fabric, which is solid and durable for long-lasting use. * Design with good quality metal all-round zipper, soft enough. * Two convenient carrying options, feature with adjustable cushioned shoulder strap and convenient hand-grip. * Waterproof, dustproof fabic for protecting the items form water. mildew, dust pest and more. * Consists of a main pocket holding and protecting for PS4 system, a front pocket for PlayStation camera, controllers and other accessories. * The padded case with anti-shock cotton fully protect for PS4 and accessories from squeeze, shock. *Great for PS4 system, games, controllers PlayStation Camera, AC Power cord, HDMI, USB cables and accessories. From the confidence in product quality, we provide 12 months no reason return service, easy-to-reach support. Perfect Design: The Front pocket can holds 2 DUALSHOCK 4 wireless controllers, AC power cord, the PlayStation Camera and HDMI and USB cables while PS4 Systems fit perfectly in the main pocket, it also compatible with PS4 ,PS4 Slim and other game consoles and accessories. Fully Protective: Fully padded case with anti-shock cotton for extra care and adds more security on your PS4 System and accessories. Nylon fabric which is breathable and waterproof, protecting the items form water. mildew, dust pest and more. Durable and waterproof exterior: PS4 hard case is made from waterproof and shock resistant nylon fabric which is environmental friendly and durable. Besides, it is immune from abrasive damage and extreme weather like pouring rain ,anti-dust and anti-fall. 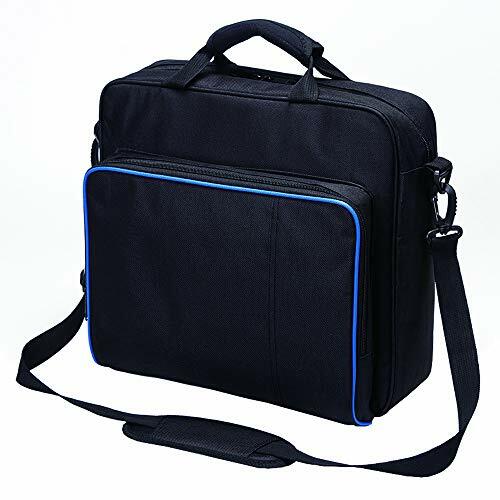 High Premium Quality: Made of high quality environmental nylon fabric, including good quality metal zipper, this PS4 bag is more solid for heavy duty use, not easy to wear and tear. It is study and durable enough for long-lasting use. 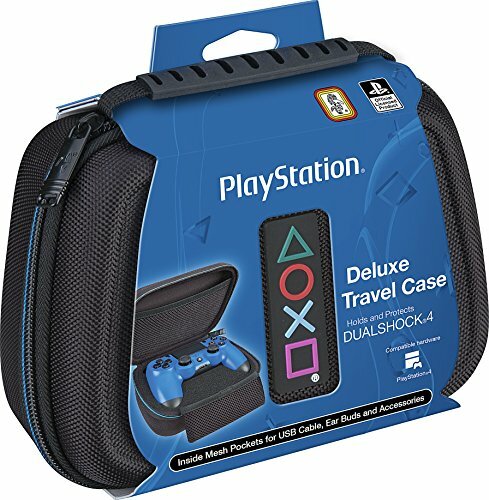 Easy to Carry: Adjustable shoulder straps and comfortable handle case will make it extra portable and carrying the fun with you on any travel without any damage or scratches to your playstation. Wide Application: Compatible with PS4 game equipment, PlayStation Camera, AC Power cord, HDMI, USB cables and so on. AC Power cord, HDMI and USB cables. Easy to carry: Adjustable cushioned shoulder strap and convenient hand-grip are padded to redeuce shoulder fatigue or comfortably carry in hand. 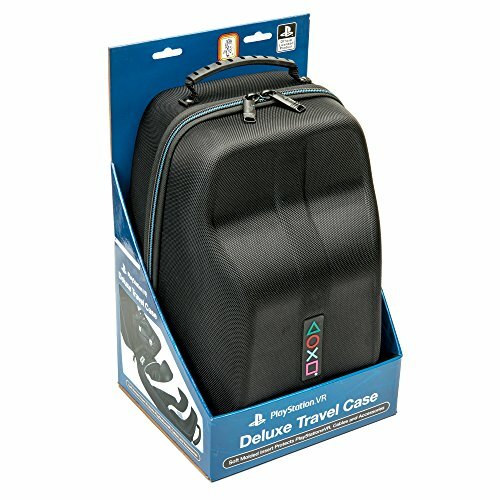 Perfect design for carrying your PS4 equipment with you on any travel. After-sales service: If you are not satisfied with these PS4 travel carry bag for any reason, please contact us directly, we will provide quality customer service. Non-human damage and malfunction will receive a free return and exchange service right way. Ultra-capacity The main bag has enough space to fully protect the main unit, and the built-in mezzanine can accommodate small objects. In addition, the outer bag has three stretchable buckles that can accommodate accessories such as gamepads. Quality Materials The body of the handbag is made of 100% high-quality nylon fabric, which is wear-resistant, dust-proof and waterproof to protect your equipment from dust, scratches and impact. Comfort The top of the handbag is designed with a handle. The handle is sewn with needlework and wrapped in soft PU leather. It is wear-resistant, dust-proof and comfortable, providing you with a good handheld experience. Flexibility Each bag comes with a shoulder strap that can be adjusted and disassembled. You can choose to assemble or disassemble it according to your needs, so that your bag can be switched between the shoulder bag and the handbag. After-sales Service If your product has product quality problems within six months, we will provide warranty and exchange service. If your product has product quality problems within half a month, we will provide return service (man-made Any problems are not in the service). Non-slip surface is great for providing better grip to enhance gaming performance. Easy to install and remove,Pressing buttons with suitable cutting provides convenient operation. Protects your PS4 from dust, scratches, damage and everyday use. Unique design allows easy access to all buttons, controls & ports without having to remove the skin. EASY TO INSTALL Easy to install and remove,Pressing buttons with suitable cutting provides convenient operation. PRECISION CUTOUTS Unique design allows easy access to all buttons, controls & ports without having to remove the skin. 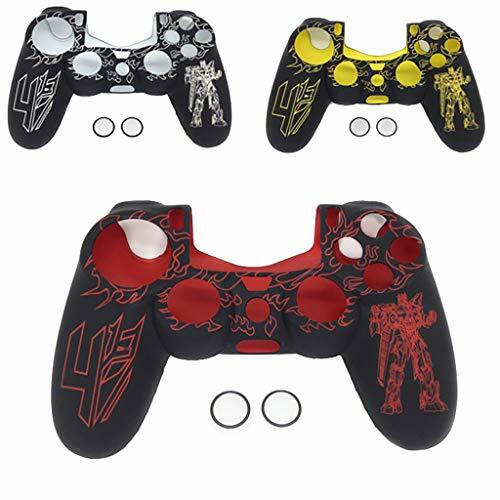 MULTI COLOR Multi color for choices to customized your controller freely. The UniKeep Playstation Game Case is perfect for your Playstation game collection. High-quality Safety Sleeve pages securely hold game discs without scratching. The attractive digitally printed design sets this game case apart from the rest. Fully enclosed and snap locking ensures the games are secure in any situation. 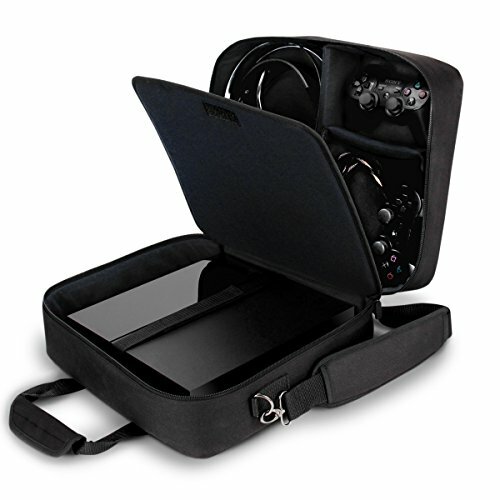 UniKeep Playstation case binder has a sleek design making it easy to fit in a bag or on a shelf. The protective case snaps securely closed so games won't fall out. This game case stores up to 10 video game discs and graphics inside Safety-sleeve pockets. This soft, non-woven material won't shed or form lint so your games are kept in pristine condition.